We will put our explanation regarding the main issue (I AM) in steps so that it shall be easily followed by those unfamiliar with issues involved. The focus of the paper is to examine whether the use of the word “I am” in John 8:58 has something to do with “I AM” in Exodus 3:14. We will give the complete verses of John 8:58 and Exodus 3:14 later on in this paper. Note 1: The reader may also refer to any other encyclopedia as well as any other Bible dictionary under the same topic, which is “Septuagint”. 1. Septuagint is a Greek version of the Old Tes)ament. 2. It (Septuagint) has already existed three centuries before Christ was born, and therefore it is authentic. The answer is because it would make it easier for us to compare the original phrase of the relevant verses (like John 8:58 and Exodus 3:14) in Greek, since both the New Testament and LXX (Septuagint) were written in Greek. Transliteration: Eipen autois Ieesous, ameen ameen legoo humin, prin Abraam genesthai egoo eimi. Note 2 : In Figure 1 the original Greek word for “I AM” in John 8:58 is ‘egoo eimi’ or in Greek ‘egw eimi’. You can refer this to any of the Greek NT such as The New Testament in the Original Greek by B. F. Westcott and F. J. A. Hort (1881) or from any interlinear Greek/English translation. Note 3: Please refer to the highlighted words in the Figure 2 above, we have marked ‘A’ for ‘egoo eimi ho oon’ (egw eimi o wn ) , while ‘B’ is for ‘ho oon’ (o wn). |metros umas = me proV umaV| unto you. |egoo eimi = egw eimi| I AM. It is clear that the Greek word that has been used by LXX for “I AM” in “I AM hath sent me unto you” (Exodus 3:14) is ‘ho oon’ and not ‘egoo eimi’ as in John 8:58. So they are two different words and have two different meanings, and thus there is no connection between Exodus 3:14 and John 8:58. ‘I Am What I Am’ or ‘I Am The Being’? And Jesus himself, when he began to teach, was about thirty years of age, being (wn) the son…..
…and because that thou, being (wn) a man, makest thyself God. So egw eimi o wn (egoo eimi ho oon) should be translated as “I am the being”, and not “I am what I am”. This attempt (evidence of divinity of Jesus Christ) cannot be sustained because the expression in Exodus 3:14 is different from the expression used in John 8:58. This is another proof that throughout the Christian Greek scriptures, God and Jesus(P) are never identified as being the same person. 1869: “From before Abraham was, I have been.” The New Testament, by G. R. Noyes. 1935: “I existed before Abraham was born!” The Complete Bible: An American Translation, by J. M. P. Smith and E. J. Goodspeed. 1965: “Before Abraham was born, I was already the one that I am.” Das Neue Testament, by J?rg Zink. 1981: “I was alive before Abraham was born!” The Simple English Bible. 1984: “Before Abraham came into existence, I have been.” New World Translation of the Holy Scriptures. 1999: “The truth is, I existed before Abraham was even born!” New Living Translation by Tyndale House Publishers, Inc.
Fourth/Fifth Century (Syriac-Edition): ?Before Abraham was born, I have been.” A Translation of the Four Gospels From the Syriac of the Sinaitic Palimpsest, by Agnes Smith Lewis, London, 1894. Fifth Century (Curetonian Syriac-Edition): ?Before ever Abraham come to be, I was.” The Curetonian Version of the Four Gospels, by F. Crawford Burkitt, Vol. 1, Cambridge, England, 1904. Fifth Century (Syriac Peshitta-Edition): ?Before Abraham existed, I was.” The Syriac New Testament Translated Into English From the Peshitto Version, by James Murdock seventh ed., Boston and London, 1896. Fifth Century (Georgian-Edition): ?Before ever Abraham come to be, I was.” The Old Georgian Version of the Gospel of John, by Robert P. Blake and Maurice Briere, published in Patrologia Orientalis, Vol. XXVI, fascicle 4, Paris, 1950. Sixth Century (Ethiopic-Edition): ?Before Abraham was born, I was.” Novum Testamentum Aethiopice (The New Testament in Ethiopic), by Thomas Pell Platt, revised by F. Praetorius, Leipzig, 1899. The theory of divinity of Jesus through the word “I AM” has not been supported by convincing evidence, so it cannot stand to the scrutiny. Even many of the Gospels as well as the most ancient manuscripts did not use “I AM” in John 8:58, and therefore the word “I AM” in John 8:58 cannot be used as a proof of divinity for Jesus, it is without foundation and a very shaky one at best. So the verse “Before Abraham was, I am” could not make someone become God (including Jesus), otherwise Jeremiah was also God since he had existed before God had formed him in his mother’s womb. As for the existence of Jesus(P) before his birth, we should remember that Jesus was anointed by God even before he was born (John 17:24). Hence, he was called ‘the Christ’ (Messiah). We would like to ask the missionary how they would explain this ensuing statement? So, is Abraham(P) also God since he can see something in the future or something in advance? Of course not, and the same goes for Jesus(P). or the reader can refer to the missionary argument here. This verse says that Jesus(P) himself could not do anything, so if he was God does it mean that God could not do anything? 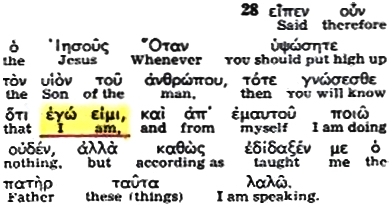 We can see that the Greek word used by Jesus(P) in John 8:28 is also ‘egw eimi’ or “I am”. So again the use of “I am” cannot prove that Jesus was God, otherwise he was a weak God who had limitations. Clearly, it is “egw eimi” or “I am”, so do these words make David God? If the answer is no, what evidence can the missionary show that makes Jesus God, simply by using the phrase, “I am”? Does “I am” or “Egw eimi” make the blind beggar God? Of course not! The same applies for Jesus(P). In short, everyone at the time of Jesus knew that he was only a prophet and not God. Figure 6 is showing the passage from the book of Revelation, verse 8. So Jesus(P) never claimed to be “the Alpha and Omega” at all, rather that was said by Lord God Himself – please refer to the underlined words in red in Figure 6 above. Almost all the versions have supported this point, please refer to New Revised Standard Version, The Amplified Bible, The New Jerusalem Bible, New International Version and New American Standard Version. So it is obvious that the KJV had thrown out “The God” and had only considered “says the Lord” or “says the Master” that implies that it being Jesus, and this is incorrect. Please be informed that the Greek word “kurios” can be translated as either “lord” or “master”. 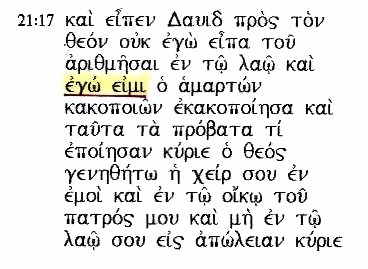 So the correct translation for these Greek words is given by the New American Bible as in Figure 6 above. Note 5: The image in Figure 7 is taken from ‘Word Study Greek-English New Testament” by Paul R. McReynolds, Tyndale House Publishers, Inc. Wheaton, Illinois, 1998. In short, we have given the facts which is supported by visual proofs to show that the words “I am” cannot make Jesus(P) as God, and the idea does not stand to the scrutiny, as the missionaries would like us to believe. Are you considering that the Greek has indirect discourse in the exodus example, “that”, and direct discourse in the john example? In the john example, if jesus were to say “i am that i am” instead, indirect discourse would similarly have to be used and the same pronoun and participle could stand in for ego eimi.